I’m glad I’m not one of those people with severe acne… knock on wood lol!! But I still get blemishes once or twice a month and sometimes reactions to new products I use. 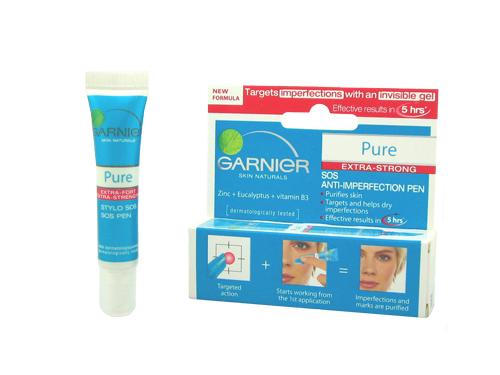 If you are like me and you want that instant spot treatment then Garnier Pure SOS Anti-Blemish Spot Pen is just what you need. It comes in a small 10ml squeezy tube for approximately $7.99. It “contains zinc for its controlling properties, an anti-bacterial agent for its cleansing power, and 100% natural cucumber extract for its energizing and skin-hydrating qualities.” It also contains salycilic acid so I don’t see how this product will hydrate your skin. It is small enough to carry in your purse or bag and apply as you feel a blemish coming. It will prevent the blemish from surfacing onto your face. You can use it in the morning after you cleanse and moisturize your face or you do apply at night again after you cleanse and moisturize your face. If you apply it in the morning make sure you wait couple secs for it to dry before you apply your face powder or foundation or whatever. I like to use it at night so I let it sink into my skin. This works really well. If I get a blemish or acne it will take couple days before it heals. If it is just an allergic reaction to a new makeup product then it will heal in a day or two. I can literally see the allergic “bump” on my face get smaller. The only thing is that it will make your face quite drying so only apply it to the affected areas. You might think this is pricey.. but for this kind of blemish spot treatment its the cheapest and most affordable. This is part of the Garnier Skin Naturals line which is only found in Canadian drugstores. Thanks to one of my loyal Youtube subscribers… you can purchase this product online and it ships to the U.S. I am just an average gal in her mid 20's trying to live life in this money eating world. I love all things to do with makeup, beauty, organization, and living on a budget. I have two Youtube channels "xxlostintranslationx" and "TheGLOSSette". My blog is just an extension of Youtube as well as quirky things I do and find in my daily life. This entry was posted in G - L, Garnier, Makeup & Skincare, Reviews and tagged blemish treatment, Drugstore, Garnier, Garnier Skin Naturals, Makeup & Skincare, oily skin, reviews, skincare, spot treatment. Bookmark the permalink.